One of our bigger projects on this beautiful Island. 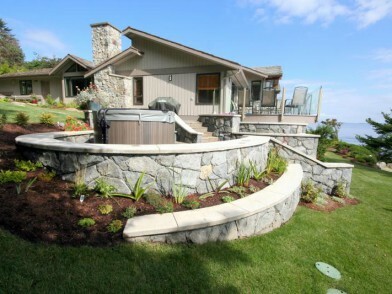 Mac Renovations employed our services 2006/07 to provide and install all the stonework required in the massive landscape project that was part of an overall renovation of this lovely home with its spectacular ocean view. We loved working here and it couldn’t have been for nicer owners. We hope that they will enjoy and relax in their surroundings for many years to come and would like to thank them for the opportunity. What place on earth could be more inviting to a stonemason than a Stone yard? To be invited to apply our talents in creating the focal pieces in Ron and Donna’s newly built showroom was comparable to being let loose in the proverbial “Candy Store”! We took full advantage. 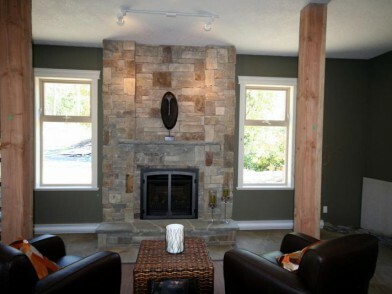 We think we succeeded in our task to design and create fireplaces and stonewalls that are worthy of Island Stone. We hope our creations will provide the warmth and atmosphere, welcoming customers now and in the future. If stones are what you’re looking for, Island Stone is the place to go. Good Luck Donna and Ron and Thank You! 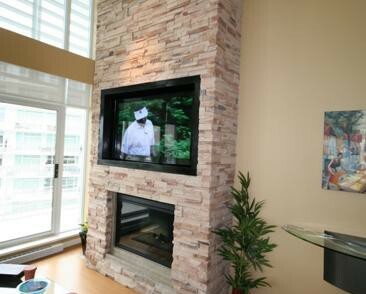 If there ever was a time and place for “Cultured Stone” it was here at Dian and Jerry’s gorgeous condominium at Songhees. As you can tell from the before and after pictures, it just “makes” that wall and we even found room for the TV. The stone not only compliments the room, but it enhances everything in it. It was a real pleasure working here. We are fortunate enough to meet and work for a lot of nice folks, but every once in a while we meet someone really special, Dian and Jerry certainly are two of them. They were so happy with our work that they provided us with a very nice letter of recommendation. Thank you! After we had completed a one of a kind fireplace at their Shawnigan Lake cottage, the owners asked us to create the wall that retains the septic bed. 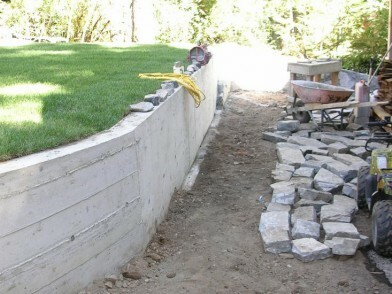 Like all of our retaining walls, it consists of a main wall built out of concrete, on concrete foundations. We then faced it with beautiful random “Loon Lake”. The colours are incredible! Something a little different from the ordinary “Blast Rock” walls.